The line of gravity moves anterior to the acetabula when lifting, bending, lowering, shoveling, or just leaning forward. It may also move forward with a protruding abdomen or in the later stages of pregnancy. 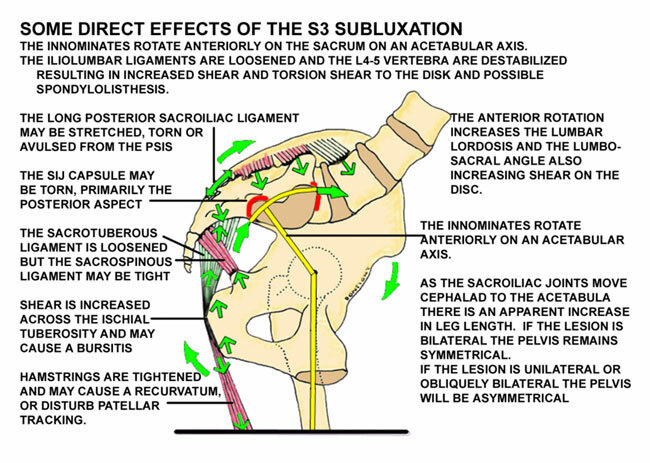 When it does, the innominates may rotate anteriorly on the sacrum on an acetabular axis resulting in a subluxation at the S3 segment. Holding a strong pelvic tilt when leaning forward in order to maintain the ligamentous balance can effectively prevent the onset of low back pain. This is best done with the rectus abdominis and the abdominal obliques. 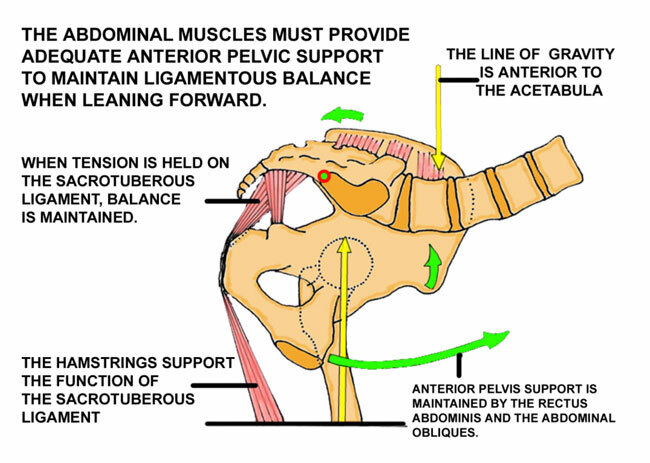 The transverse abdominis has only a scant effect on the posterior pelvic tilt. In the absence of anterior pelvic support when the line of gravity moves anteriorly the innominates will tend to rotate cephalad and laterally on the sacrum at S3 and caudad and laterally on the sacrum at S1. The sacrotuberous ligament is loosened. The ligamentous balance is disturbed and the innominate bone will subluxate cephalad and laterally on the sacrum on an acetabular axis. With the dysfunction in anterior rotation the SIJs will move cephalad and anteriorly relative to the acetabular axis causing an apparent lengthening of the legs. If the dysfunction is greater on one side the legs will appear to be of unequal length, but both will still appear longer than normal. The pelvis will be asymmetrical and the sacral base will be higher on one side and the sacrum may appear slightly twisted. Note how the ASIS will appear lower (AB) and the PSIS higher (PQ). This changes to normal symmetry with appropriate correction. impression of a multi-factorial etiology. There may be pain in the abdomen at Baer's SI point described as being on a line from the umbilicus to the ASIS, two inches from the umbilicus. One woman patient had both low back pain and abdominal pain for four years with removal of both of her ovaries. She was free of both the back pain and the abdominal pain immediately with correction of her SIJs. An impairment of the function of the sacral origin of the gluteus maximus may precipitate a trochanteric bursitis. An impairment of function of the piriformis can cause a bursitis beneath the tendon at the greater trochanter. Shear at the ischial tuberosity may cause a local bursitis/tendinitis with pain and tightness in the biceps femoris. Buttock pain at the PIIS is at the location of the dysfunction at S3 and is the location of the conjoint origin of the piriformis muscle. With a bilateral subluxation the horizontal pelvic swing is shortened. With a unilateral subluxation and apparent long leg you will ambulate with a high iliac crest on the more painful side. 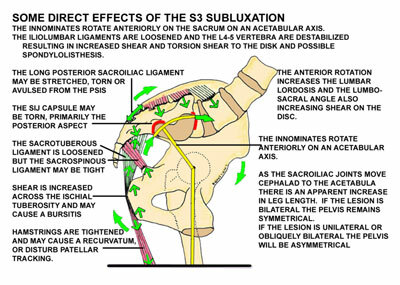 With the compromised bilateral subluxation at S3 you will ambulate with a short leg on the more painful side. Functional lateral sacral flexion, function of the piriformis and the sacral origin of the gluteus maximus are impaired. 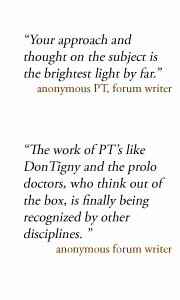 Dorman described inhibition of the gluteus medius with anterior innominate rotation. The resultant weakness in the abductors may allow the pelvis to drop prematurely on the contra lateral side increasing loading forces and shortening the length of the step. Dannanberg described an inhibition of the peroneus longus with SIJD causing a hallux limitus (a rigid big toe) relieved with orthotics. The peroneus longus supplies up to 18% of the strength to the sacrotuberous ligament through the kinetic chain. The anterior innominate rotation will loosen the iliolumbar ligaments destabilizing L4-5, S1 and increasing shear and torsion shear to the disks. L5 tends to shear anteriorly on S1 and may initiate or increase a spondylolisthesis. Any anterior shearing movement of spondylolisthesis will tend to tighten the iliolumbar ligaments again, which may prevent reduction of the subluxation at the S3 segment. Increases in fascial tightness may occur with increased loading forces that may cause some stiffness and limit hip motion or passive straight leg raising. 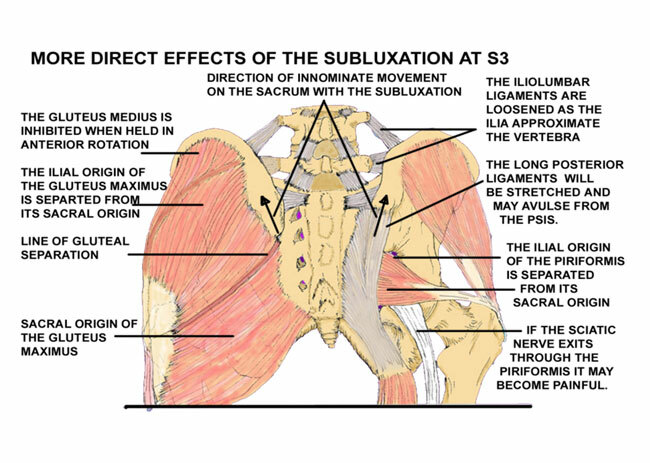 Pain in the groin may be caused from a vertical shift of the pubic bone at the symphysis if the SI dysfunction is more on one side than the other. If motion in the SI joints from SIJD is blocked posteriorly the forces of asymmetry when walking may also cause pain anteriorly at the pubic symphysis. The sudden release of the balanced loading via the biceps femoris can strain the lateral capsule of the knee or may subluxate the head of the fibula. As the innominate bones will tend to separate and spread with this dysfunction, any increase in intraabdominal pressure such as caused by a sudden cough or straining with a bowel movement will tend to further increase the spreading and thus increase the pain. The anterior inclination of the pelvis with SIJD will cause a lumbar lordosis and an increase in the lumbosacral angle, increasing shear to the disk and inhibiting the multifidus muscle. 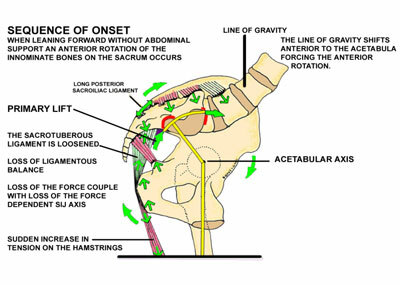 Dorman found a positional inhibition of the gluteus medius when the innominate in held in anterior rotation. Dananberg found an inhibition of the peroneus longus with SIJD causing a functional hallux limitus. The gluteus maximus, the piriformis and the iliacus muscles each have origins on both the sacrum and the ilium. SIJD can stress these conjoint origins and cause pain in any or all of these muscles. If the SIJ is not corrected the force couple will not function properly. Loading will be increased to the femoral head and can cause pain down the legs and up the back giving the impression of fibromyositis. When standing, weight bearing on the head of the femurs has a buttressing effect that is lost when sitting. Weight bearing is on the ischial tuberosities when sitting, which tends to loosen the sacrotuberous ligaments. A pelvic obliquity may increase tension to the floor of the pelvis. Pelvic congestion plays a major role in female patients with dysmenorrhea, ovarian cysts, and premenstrual syndrome as well as in male patients with prostatitis and prostatodynia. Pain may be referred into the groin and cause a pseudoepidymitis. May cause incontinence, especially in women, relieved with correction. 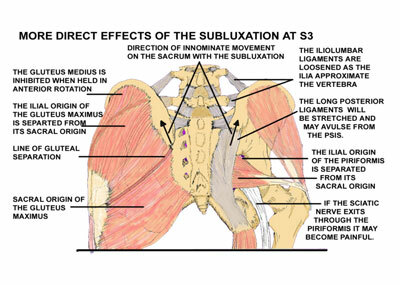 Fortin found rents in the capsule might leak synovia to the lumbo-sacral plexus, to the root of the fifth lumbar nerve and into the body of the psoas muscle and cause neurological symptoms. Leaking synovia may become encapsulated and form cysts on the sacroiliac joint. Separation of the sacral origin of the piriformis muscle from its ilial origin at the superior margin of the greater sciatic notch at the PIIS can cause pain in the piriformis muscle. 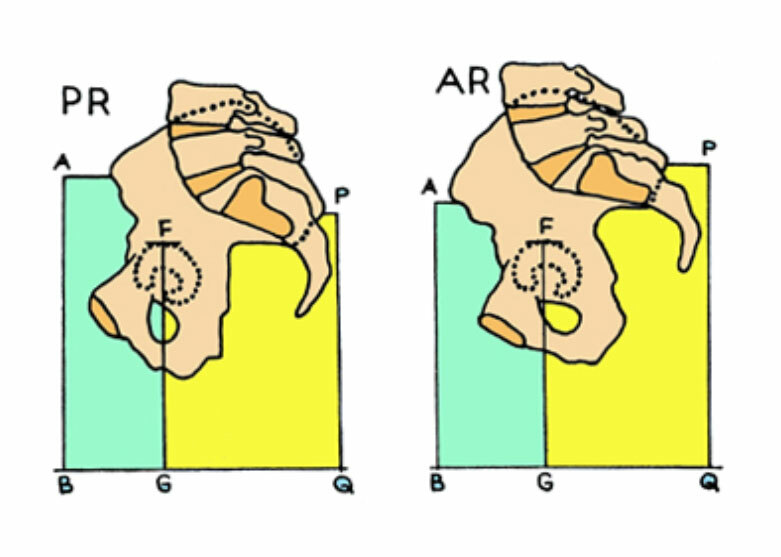 Any apparent sacral torsion will be corrected with correction of the innominate bones on the sacrum. It is not necessary and sometimes counter productive to attempt direct correction of sacral torsion. The sciatic nerve is also stretched with this anterior rotation and when combined with the irritation from the separation of the piriformis muscle the resultant neuritis is to be expected. Sciatic neuritis is often present in the absence of disk herniation. If the dysfunction is asymmetrical it will unlevel the sacral base and may cause a lumbar scoliosis with bulging disks. If this occurs in pre-pubertal children the asymmetric sacral base can cause asymmetric development. When the innominates rotate downward anteriorly on the sacrum, the nerve roots may be stretched. When the nerve root gets stretched, it gets smaller and compression deformity of the nerve roots occurs. 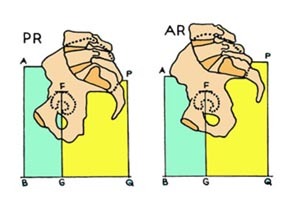 Total mechanical block occurs before 15% elongation. The dorsal roots are more susceptible to stretch that the ventral roots, hence changes in sensation are more likely to occur. Pudental Nerve Entrapment: Pain referral patterns may simulate entrapment of the pudental nerve. Correct the SIJ first and then reassess. 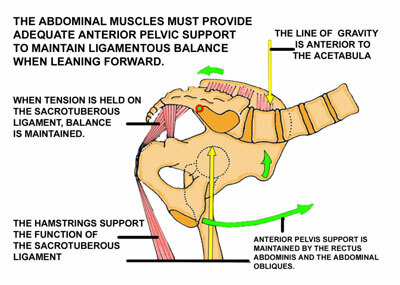 The anterior inclination of the pelvis will stretch the psoas muscle and gives the appearance of tight hip flexors. Stretching the hip flexors will increase the dysfunction. Correction of the dysfunction will take the stretch off of the hip flexors.